Manufactured from high quality stainless steel with wooden handle. 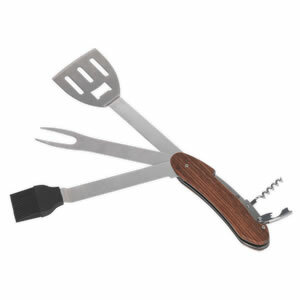 Features basting brush, bottle opener, corkscrew, fork and spatula. Multi-tool separates into two halves allowing for the spatula to be used separately, also enabling the tool to be cleaned easily. Supplied in a nylon pouch.